Hey! At first I tried making a single “End of December” post, but not only was it extremely long and messy, I felt like I had to hold back on some screenshots and things I wanted to share in order to make it less long. This has just been such a busy half-month! So now I’m dividing it into this town improvements post, along with another post I have scheduled on town events, holidays, and daily happenings. I’ve updated my dream address now, so if you’d like to visit first without being “spoiled” on the changes I’ve made, feel free to visit without reading this post. 🙂 Though I’ve never personally felt that seeing pictures of a town beforehand made me want to visit a dream town less (quite the contrary), or enjoy visiting it less. I like to have archived pictures to look back on, though, because dream addresses don’t last forever…like my Autumn update is completely gone now, so I’m glad I have some pictures of that time period to look back on! The busiest, most city-like part of town, and also the “sun” side of town if you’re familiar with my plans about that! 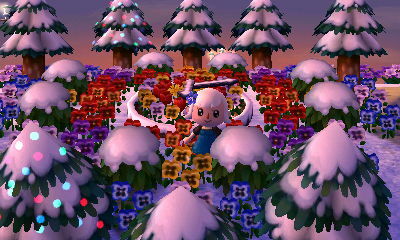 As you’ll see, though, I took away some of the sunny flowers to look better with the snow. The gradients are more sunset-themed than sun-themed, in a way. I think it looks much better now, for this time of year! 🙂 I’ll add back the red, orange, and yellow lilies when the snow melts, though! Teru gave me the idea that I could balance out the rock in front of my town hall with another rock — a “permanent” gem rock! I loved this idea, so I covered up all the spots where the gem rock could spawn with flowers/patterns, except for the one space I wanted it to go. It took a few tries to get the exact-shaped rock I wanted, but now I have it! 😀 I’m really happy about it and feel so much better about my town hall area now! Part of what bugged me before was not just the rock itself, but the imbalance the rock caused, making your eye drawn to the rock. Now the rocks are balanced, so (imo at least) it allows your eyes to travel elsewhere. 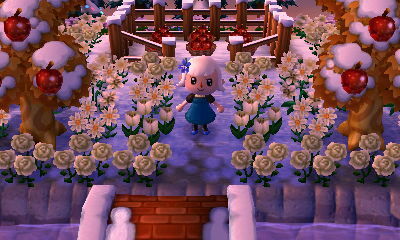 I changed the train station’s fountain garden for the same reason as the town hall garden…I liked how it was before, but it didn’t look as good against the snow. I’ve finished Lyra’s castle entrance now, which has lots of gold and sunny colors because I like to imagine that her castle represents the sun (in contrast to Estel’s representing the moon). As you go farther away from her castle, though, the colors fade from gold to pink to purple to blue. 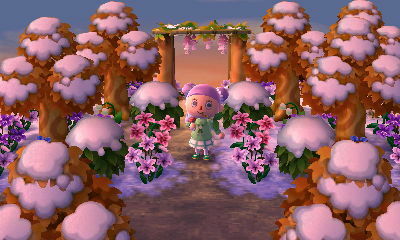 I felt like I had to have these extravagant flower arrangements to make up for the fact that there isn’t room for any big PWP landscaping in front of her house, due to the pond being in the way. I think that it’s worked out okay regardless of the pond, and that it’s forced me to be more creative with the flower arrangements instead of relying on PWPs. But I might one day add a bench behind the pond! Another colorful spot is the dirt path connecting Re-Tail and a ramp to the beach! It used to only have red, white, and yellow tulips, but I’ve been working on growing more tulip hybrids so that I could make this change. 🙂 I also planted some azalea bushes here and there, which should look pretty when they bloom in the springtime! For a long time I’ve had red, white, and yellow lilies lining this path to help in growing hybrids, but now I’ve accumulated enough lily and violet hybrids to use those instead! 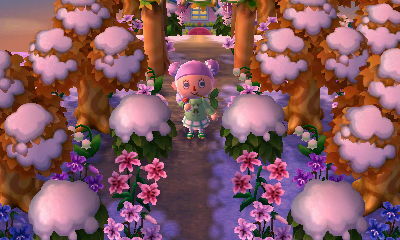 I didn’t use a “pattern” for the flowers lining the path; part of this is because many neighbors live near the path, so it would be hard to find a color pattern that coordinates with all of the houses. Plus, I like running along the path and seeing streams and pops of unexpected color — maybe it looks messy to others, though! On the beach on this side of town, there are some warm-colored lilies lining the cliff and banana trees. Once Charlise moved out (I’ll go into it more in the next post), I was able to move in a new neighbor, re-do this area, and add a lighthouse! I got the idea for a villager house near the lighthouse from Teru’s neighbor Tangy living next door to her lighthouse — I hope you don’t mind, Teru! It also lines up well with my other neighbors lining the western seaside cliff. The quieter, less developed part of town, and also the “moon” side of town, which is especially enhanced at this time of year because of the snow and auroras. Built a hot spring recently! I’ve built the hot spring before in two different places, but I think this is its final home now. 😛 I love how the water looks at night! 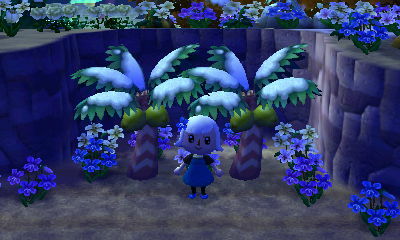 The beach on this side of town has cool-colored violets and white lilies lining the cliff, and coconut trees. Bruce and Julian are the only non-human residents on this side of town, so it’s good that their houses go with the atmosphere! A living room/kitchen with some plants and diamond modern wood furniture (I like how that series looks with the parquet floor). A magician’s workroom, with the few magic-themed furniture pieces that I know of (the cauldron and crystal ball), along with as many strange contraptions and gadgets I could cram in there (the fireworks prizes seemed good to me for this). If you have a different idea for how one could make a magician’s workroom, I’d be really interested to know — not sure if I’m 100% satisfied with this room! A quiet and peaceful, old midnight garden. I was going for the feel of a vibrant magical forest clearing, maybe the location of a fairy feast or something… I’m not sure if it’s too busy and if I should tone it down a bit, so feedback is appreciated! It’s a tricky peninsula to work with, and I think stuff like this is why many people prefer having straight-river maps. But I do think this has the potential to maybe be a cool spot in town eventually when I work more on it… I was thinking I could have it be a somewhat seasonal area in town, like in the spring and summer I could have a topiary garden, in the winter I could have an illumination park, and in the Fall I could have a garden of Autumn colors/a pumpkin patch. Right now, though, it only has these two PWPs, because the two of them conveniently block houses from moving into this peninsula, making house plot resetting a lot easier! One is the fence PWP, which used to be a faux-pumpkin patch in the Fall, but now it’s an apple orchard. And the other is the flower clock, which probably looked better in Autumn, but for now I’m keeping it since it’s a convenient house repeller! 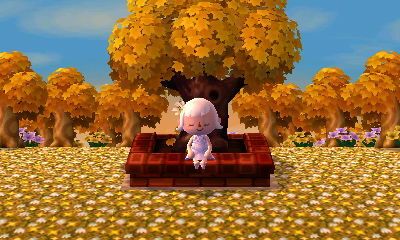 Posted on March 25, 2014 by Amy •	This entry was posted in AC:NL, Citalune and tagged Animal Crossing. Bookmark the permalink. Ahh thank you, that’s so nice of you to say, I’m glad you think my town’s come a long way 🙂 Aww and no you’re town is beautiful as well, and unique since it has a story behind it! Wow, your town is gorgeous. Also, when you were listing the colors for your one garden, how did you change the color of the words? Your attention to detail is so enviable. :3 I love reading your posts about the technicalities, such as precise villager house placement and the hues that compliment this PWP and that building, so 🙂 . Really makes me look at my own display with a more critical eye! Thanks so much for the feedback!! I kind of wanted to keep it from looking too sinister, since the character I was inspired by wasn’t an evil magician, and in the book, magic was seen as a sort of scholarly pursuit (like other, more normal fields of study). But I agree with you that it could definitely use more mysteriousness and overt allusions to magic, and I’ll try to think of ways I could do that! Wow I really like that idea, thanks! I’ll consider it 🙂 The fact that it’s in the center of town does kind of seem like I should do something extra special with it that ties into my theme (though an illumination park and a topiary garden are tempting for me as well). I can’t wait for my next visit!! Congrats on your rock!! Lol, what a strange thing to congratulate on 😆 But damn…that must have taken a ton of work, filling every single square to get it. And you’re right, it does let your eyes travel over the rest of the scene now 😮 The twin rocks practically blend into the field of violets. WOW Lyra’s castle entrance looks glorious O.O I can’t wait to walk through your dream town, and when I get to Lyra’s castle it’ll be like the sun came out! Or was setting in a dazzling display 😀 Aside from that I love the random layouts of colours along the rest of your paths, like a step away from the carefully organised gardens of the important establishments into the more playful and carefree (though from experience that can take even more work and organisation!). 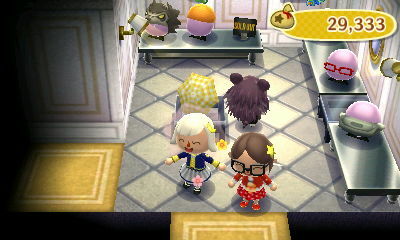 Haha, I like Violet’s fun new concept xD It allows for some pretty interesting rooms, that’s for sure! I actually really like the basement, and if there ever was a vibrant clearing in a magical forest, that’s how colourful and busy it’d be ^^ The humble (by Citàlune standards 😆 ) garden entrance to her house is perfect too. Thanks! 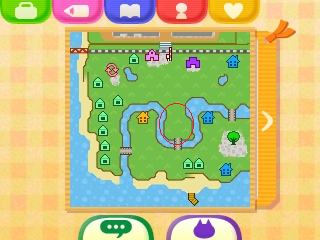 🙂 It actually wasn’t too hard to cover up the remaining spots, since I only had to cover up the empty spaces that weren’t touching a tree, a bush, a river, or other obstacle, and my town’s gotten pretty filled up with stuff 😛 I really appreciate you giving me the idea so that I can enjoy my town hall area more! I agree, sometimes I would find the seemingly less organized gardens harder to make, because I wanted them to look kind of random, but at the same time, wanted to have a nice balance of colors that was pleasing to the eye. 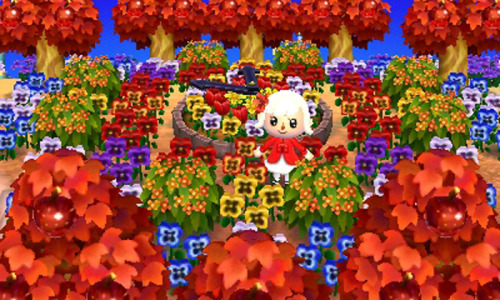 The hardest part of my AC;WW town to arrange was the colourful pansy patch outside the shops, so I can appreciate that it takes more work than meets the eye ^^ (like not having two of the same colour side-by-side and stuff like that). I heard about your mishap with Erik’s house too, what a bummer >.< I hope you feel better about it soon! 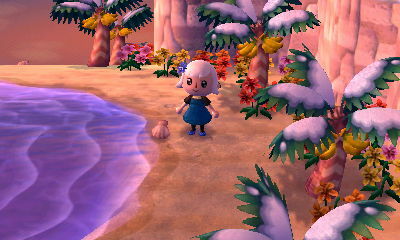 And maybe your concept of time in AC is different to mine (I still feel as though it's a new game :P), but those 16 villagers move out quicker than you expect! 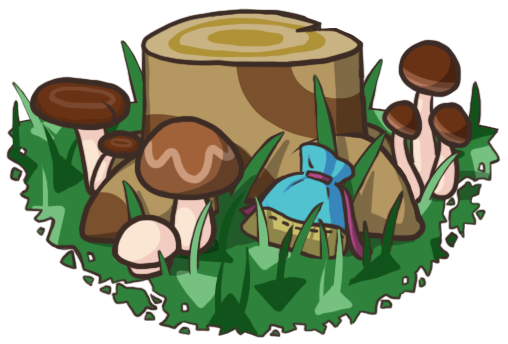 Though it's also understandable that you want to fill up the dream villagers quickly so you can stop stressing and resetting over house locations. I’m not as upset about it now as I was when it first happened, but I still hope for him to move out soon. His house is an inconvenience as well as an eyesore where it’s located, since it’s in the middle of a frequently used path. I guess I just find the prospect of cycling through 16 neighbors really daunting, especially since I’ve yet to cycle through 16 neighbors so far in the game, and because I already have 8/10 dream neighbors, so there would only be so much “room” to cycle. I’d have to keep cycling out the newest neighbors to my town, you know? And then keep resetting for their houses to go in a half-decent spot, and keep postponing the PWP plans I’ve been wanting to do… so I think at this point I’m just going to go with the second lazy neighbor I was debating, Doc. I had a hard time deciding between Doc and Erik, and even after I decided on Erik I kept having second-thoughts and doubts, so I think I should be happy enough with Doc. If this mistake had happened with one of my other dream neighbors (like say Julian), it would be even more frustrating because I wouldn’t have a good second option I’d be happy with. Oh, in that case maybe it’s fate that you’d get Doc ^^; Oh that’s true, you’d already begun getting your dream neighbours so you wouldn’t have cycled as quickly… And I totally understand it’s not worth putting your town plans on hold so long for. Oh haha I didn’t pay anything for him, so no worries there! 😛 I’ll let you know when he’s packed up, hope you’ll have a spot free 🙂 I’m not sure what to expect/predict for when he’ll pack up, if it could be sooner than I think, or if it could take a while. 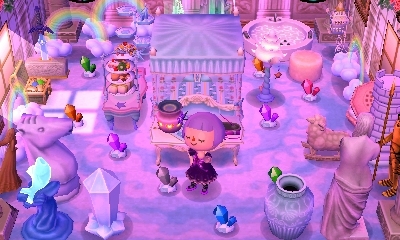 I was just looking through some older posts and I absolutely LOVE the fairy feast room (Maybe I missed this post?). It has given me great inspiration for Lenore’s spring room and Autumn’s fall room! 😀 I need to collect more flower furniture for Lenore’s spring room! I wish there were big flower tables-maybe I can make a “bouquet” table out of the little ones? I’m not sure if we’d “met” back when I made this post hehe. Thanks, I’m glad you like it! 🙂 I liked the room okay, but was still a little unsatisfied with it so I ended up turning it into the room with all the bamboo grass. A bouquet table sounds real cute! The way I collected extra flower furni was TTing on my second copy until I got copious amounts of weeds, at which point Leif shows up and has you pull them all up in exchange for one of the flower pieces.